Whether you're a rider, a team captain, a volunteer, or a virtual rider, your fundraising mission is important. It supports those making extraordinary discoveries and 100% of rider-raised funds benefits cancer research. Ask one of the 1.6 million Americans diagnosed with cancer last year: research improves outcomes for cancer patients. We offer a variety of tools and resources to support your fundraising goal. You must fulfill your fundraising minimum in order to participate in the Victory Ride. The deadline for reaching your fundraising minimum is Wednesday, May 15. 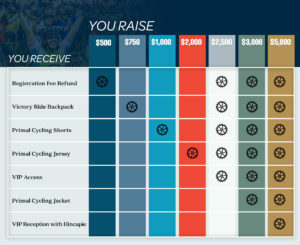 Riders, virtual riders and volunteers are all eligible to earn fundraising rewards. Riders can earn both individual rewards and team rewards. All fundraising rewards earned by riders and volunteers will be distributed at the Ride. For virtual riders, we will distribute your fundraising rewards after the event. Click here for information on team rewards! You're on a Mission, and We're Here to Help! Whether you're a rider, a team captain, a volunteer, or a virtual rider, your fundraising mission is important. It supports scientists making extraordinary discoveries. Download it, and refer to it often as you fundraise to defeat cancer. Employer matching gift programs are a great way for your donors to double their contribution to the fight against cancer. Visit this page to find out more on how to ensure matching gifts are allocated to your fundraising page, or email: [email protected]. The deadline for all matching gifts is May 1. Donor Advised Funds (DAFs) allow individuals to gain an immediate tax advantage for money they have set aside exclusively for charitable giving. Cary, NC 27513-2259 / ** This DAF payment to the V Foundation is in support of: <VICTORY RIDE PARTICIPANT Name here / email here>.